Unlike the previous meeting, Udpa's apology was followed by contention between the board and Larry Nassar survivors, many of whom were angered at what they said was "aggressive" treatment of the second wave of survivors during private negotiations. Discussion on the board's agenda items took place between two periods of public comment. Comments on items "germane to the agenda" were allowed before agenda items, many of which were members of MSU's Graduate Employees Union expressing frustration at their contract negotiations. The members alleged MSU has not sent the union any counter-offers in two months, despite rejecting the union's initial proposals. All other comment was reserved for the end of the meeting. This included "Wave 2" Nassar survivors, or those who were not included in the initial lawsuit against MSU. Survivor Kristin Nagle said she was offended by comment from Nassar survivors not being considered "germane to the agenda," despite many being invited to the meeting for a formal apology from Udpa. She said MSU had no problem profiting off abuse through the gymnastics program, while the fallout of her abuse has been financially devastating to her. "This time you really need to hear what I'm saying," Nagle said. "Countless young women, including myself, have testified to the lasting psychological, emotional and cyclical impact of sexual abuse we endured as girls, courtesy of this institution. I stand here today to reiterate a point that has been glossed over, and that is the economic toll that sexual violence has on survivors." Following the meeting, Chair of the Board of Trustees Dianne Byrum said MSU is still in active negotiations with Wave 2 survivors. "They've all been made offers and the fund is not exhausted," Byrum said. "It is a work in progress. We do hope to settle with all of them." Tensions culminated at the end of the meeting, when Trustee Kelly Tebay yielded time to Leslie Miller, the mother of survivor Emma Ann Miller. Leslie Miller engaged Byrum about her daughter's reimbursement claims through the intermittent healing assistance fund being rejected, sharing her frustration. Byrum told Miller any rejected claims are being reviewed and MSU intends to pay all the claims. Byrum said the interim fund is not ideal, but was introduced so there was not a prolonged wait while the permanent fund is being developed. "We knew it was going to be bumpy, we told people it would be bumpy, but it is our intention to have people seek counseling, get the help they need, and those bills will be reimbursed," Byrum said. Following the exchange, Miller confronted Paulette Granberry Russell, MSU's Director of Inclusion and Intercultural Initiatives. Russell attended the meeting to present the 2018-19 Annual Diversity Report. Russell, the former head of MSU's Title IX office, testified at a preliminary hearing for former MSU President Lou Anna K. Simon Tuesday, often claiming she did not recall details involving Nassar survivor Amanda Thomashow's 2014 Title IX case. Miller told Granberry Russell she has added her to her "prayer list." "I've looked at your resume, with somebody with that kind of resume, I do not understand how you cannot remember that name, or even meeting with her," Miller said. "I'm praying for the truth to come out, the real truth." The board quickly adjourned the meeting during the confrontation, and Miller was escorted to the back of the room by security. She was met with applause. In spite of the tensions at the meeting, Byrum said she feels the tone has changed at the highest levels of the administration and she feels the board has made steps in the right direction. 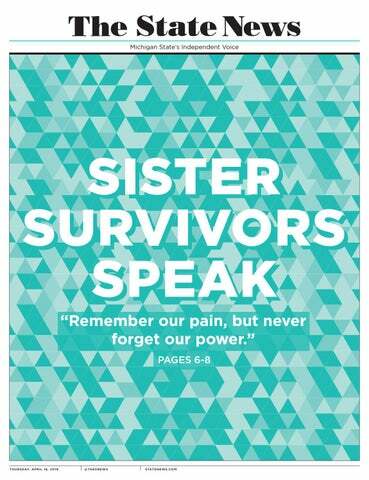 "I think that healing is a journey, it's a journey for the sister survivors. It's a journey for MSU community," Byrum said. "It's not going to be a journey that is traveled in one day, or one week or one year."